After last weekend's amazing time spent with original Airwolf composer, SYLVESTER LEVAY (see Jan Szulew's separate Munich Trip Blog post on his Orchestrator's blog) outside Munich, Germany, this weekend has been back to the grind. 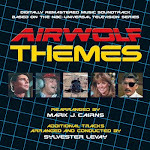 So, I've two MP3 teasers ready to Blog, the first of which is here for the Wagner-esque theme that Sylvester Levay wrote for the egotistical character actor, Blaze (played by the brilliant John Calvin) in Airwolf's TV PILOT episode; the Movie PILOT had different (inferior) music on this particular track. 1st Season Airwolf 'PILOT' episode had the superb Bellisario regular actor JOHN CALVIN acting in the brilliantly egotistical role of 'Blaze', who thought he could fly a chopper better than Hawke. Shows off Don's humour to the fore. Sylvester Levay wrote a wonderful Wagner-esque theme for the egotistical character of 'Blaze' on the fictional movie set in the Airwolf TV 'PILOT' episode. Here Dom is trying to explain to the local television news report Mona Khan (played by the DEE DEE RESCHER) about the hammerhead stall manoeuvre that Blaze has just pulled inadvertently whilst trying to control [in sheer terror!] 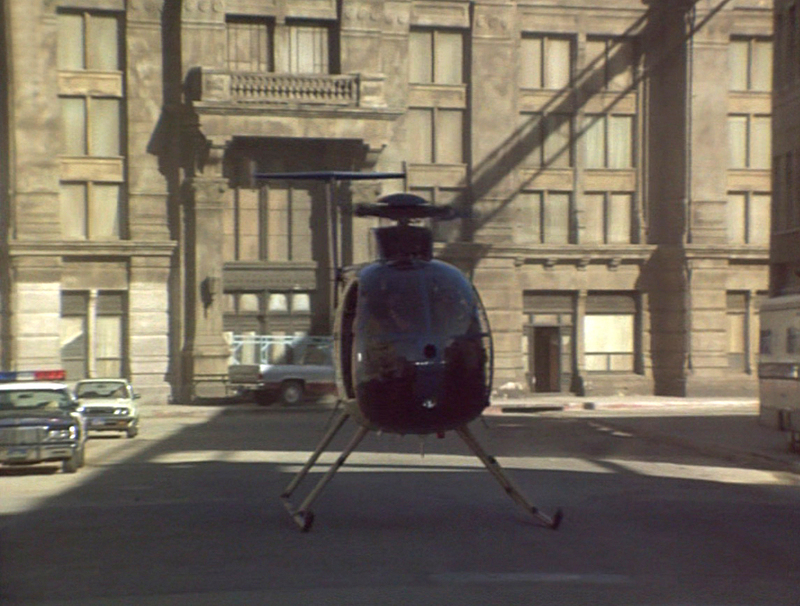 the Hughes 500 [later used as Caitlin's Highway Patrol chopper in 2nd Season episode, 'SWEET BRITCHES'] for the cameras. Sylvester Levay's character theme that he composed for Blaze during Airwolf's Pilot episode, and one of my personal favourite just perfectly summarises the naive showmanship that the egotistical movie star is trying to portray for the cameras and Mona Khan's local news crew. Using lots of bombastic brass and quick string runs, it provides the wonderful Don Bellisario black humour of watching Blaze's sheer terror during his losing more and more control of the flight and over-estimating his own abilities. Was Don having a dig at certain Hollywood actors at the time? We'll never know. "There!" as Blaze comes blazing around the corner on the deck to dust the camera crew. Both JAN-MICHAEL VINCENT and JOHN CALVIN got separate joy-rides up in the Hughes with 2nd Unit Director and Pilot, the late DAVID JONES, acting to a static camera which you can see the shadow off on Jan's shirt. If you look really closely you can see this one-shot, multi-camera take of Aerial Cameraman, STAN McCLAIN (Left) holding the big 35mm film camera on his right shoulder, with the late DAVID JONES doubling for Blaze. 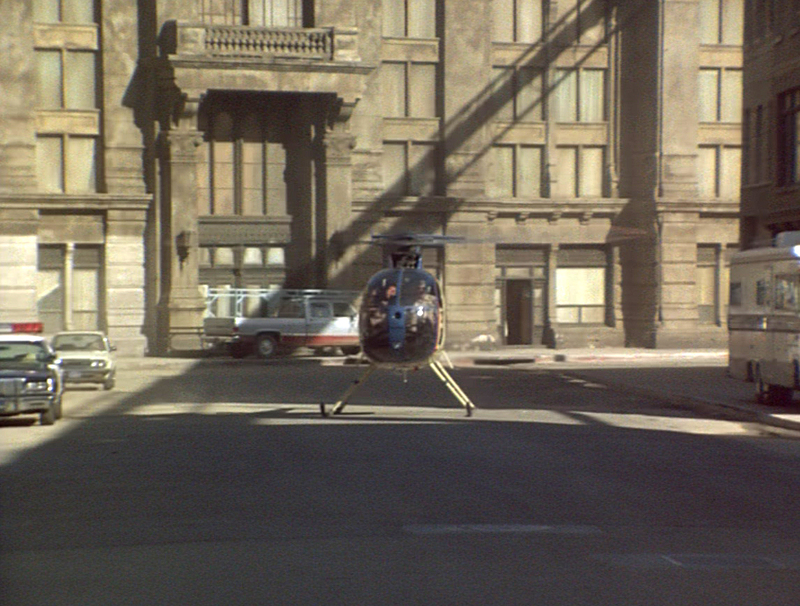 Then it's cut from Stan's camera to the two cameras on the ground as they pass over the crew. In the take-off shot you can see Jetcopters' owner PETER McKERNAN, Snr in Hawke's seat with his arms folded. So 'PROOF THROUGH THE NIGHT' and its Holy Grail Russian "Song of the Revolution " Poljuško Polje theme will be following this Blog next. "PROOF" though, has proved challenging, as there's another live cello solo in the last part of this one for the Russian theme. It's being mixed in with orchestral and includes the lab sequence at the start, the encounter with the MIGs and the tune when the Russians are closing in on Dom and Moses' position in the cabin, to finish with Hawke's cello rendition when Natalya Rostoff is singing her version of Polusko Polje (we've obviously left her voice out!). It's now finished so it's just as soon as I can get the time to get another blog up you'll all here it.